The HP LaserJet Enterprise MFP M725f is a high-volume laser multifunction unit capable of printing large-format documents up to A3 in size. It's a true office workhorse and an excellent document handling centre, featuring a wide range of office-specific features. 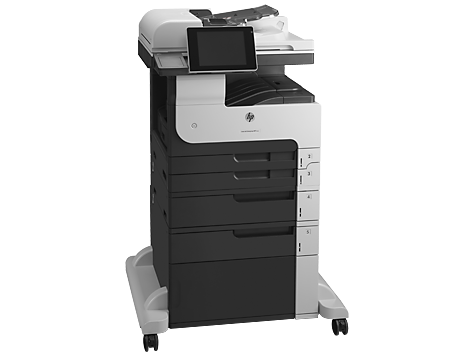 The HP LaserJet Enterprise MFP M725f all-in-one prints, scans, copies, and sends out and receives fax messages, making it the ultimate office tool. It has an eco-friendly design, featuring energy and paper-saving features. In addition, it helps reduce waste by scanning, storing, and distributing documents digitally. The HP M725f LaserJet printer is an excellent addition to any workgroup, although it's quite a huge investment. The HP LaserJet Enterprise MFP M725f laser multifunction printer is relatively compact, measuring about 745x681x1160 mm. It offers versatile connectivity including high-speed, USB and Ethernet for network support. Wireless connectivity is optional through a hardware accessory, which allows Cloud and AirPrint support. The LaserJet Enterprise M725f multifunction printer is designed to work with a wide variety of operating systems, including major OS from Windows and Mac. It has a total media capacity of up to 4,600 sheets, with the additional paper cassettes. In addition to flexible connectivity and high-performance features, the HP LaserJet Enterprise MFP M725f black and white laser printer boasts fax support as a standard. It has an impressive transmission speed of up to 33.6 kbps and it can broadcast to a total of 100 locations. The HP M725f printer even features an expandable memory to enhance data processing speeds and overall printer performance With the high capacity HP LaserJet MFP M725f black toner cartridge installed this device can print as many as 17,500 pages to help maximise productivity in offices. The HP LaserJet MFP M725f mono laser printer, however, costs a lot upfront, making it a huge investment for businesses. Nevertheless, the LaserJet M725f MFP is a complete document processing system that eases document handling in the office.